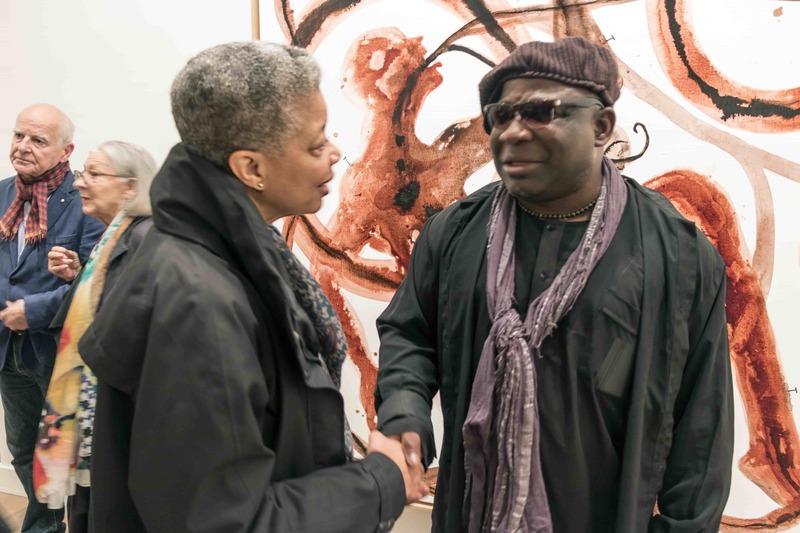 Barthélémy Toguo’s exhibition, Strange Fruit, opened at Galerie Lelong in Paris on October 12, 2017. If you’re wondering whether this show has anything to do with Billie Holiday’s 1939 recording of the same name, wonder no more. The exhibition takes its name and theme directly from the song. Through the art created for it, Toguo’s intent is to denounce race-based violence across the world. The ceiling of the exhibition room serves as the mounting space for the installations called Strange Fruit I to VI. 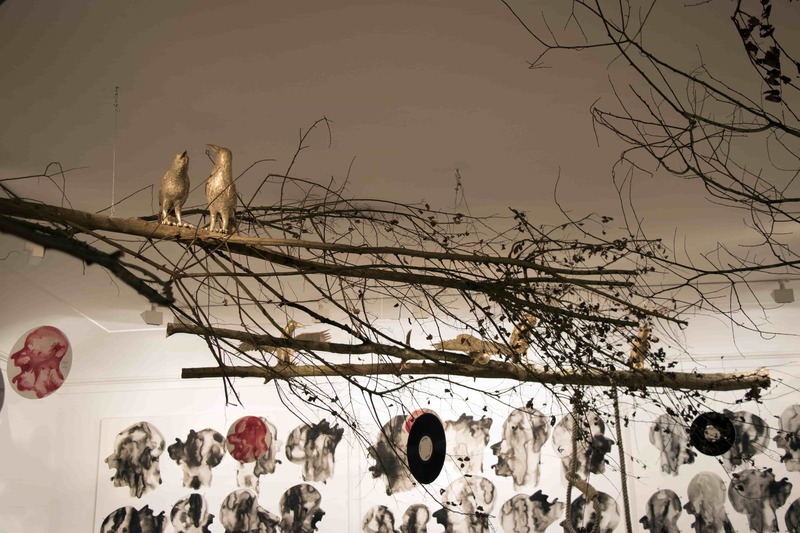 They consist of tree branches that evoke the lynchings of the southern U.S. Brass crows perch on the branches, which are hung with black vinyl discs that represent the vinyl records upon which Billie Holiday’s song was recorded and sold. On the flip side of these discs, Toguo has depicted the heads of black people – painted in watercolor in his inimitable style – on a white background. The song plays softly in the background. 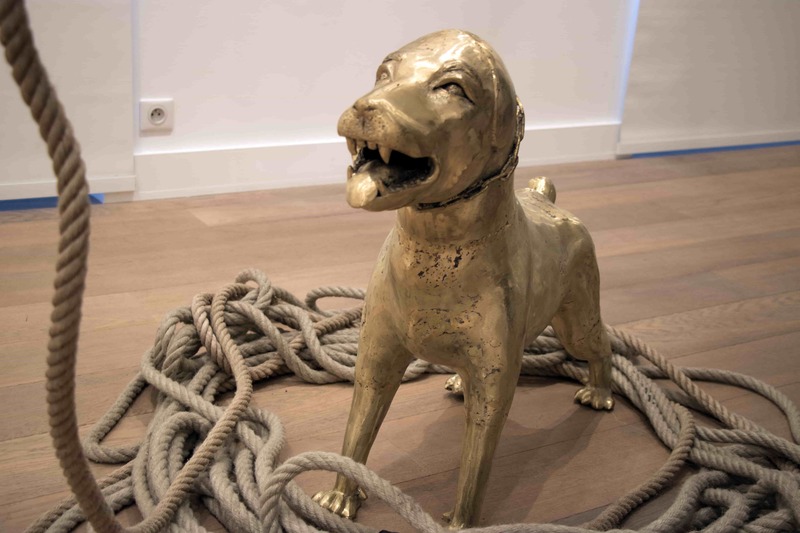 At both ends of the exhibition room, sculptures of dogs made from brass guard ropes that are flung over the tree branches, each of which ends in a noose. 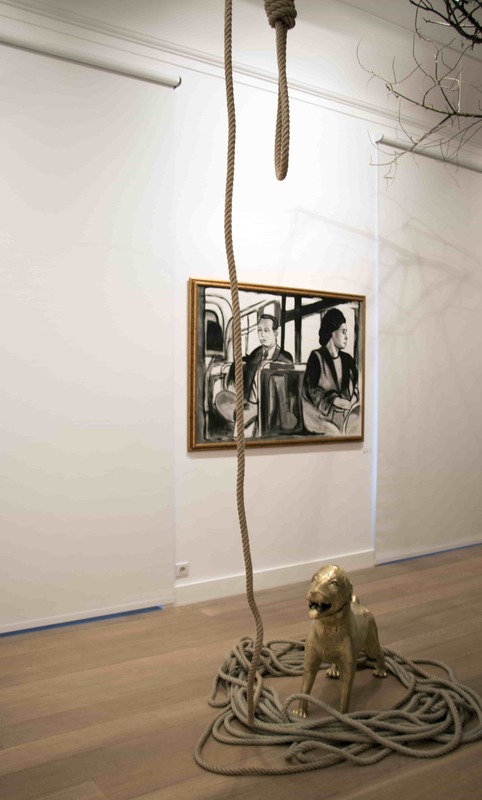 At the far end of the exhibition, blackened wood chips in tin buckets are also placed near the noose. These installations are called White Dog I and II. 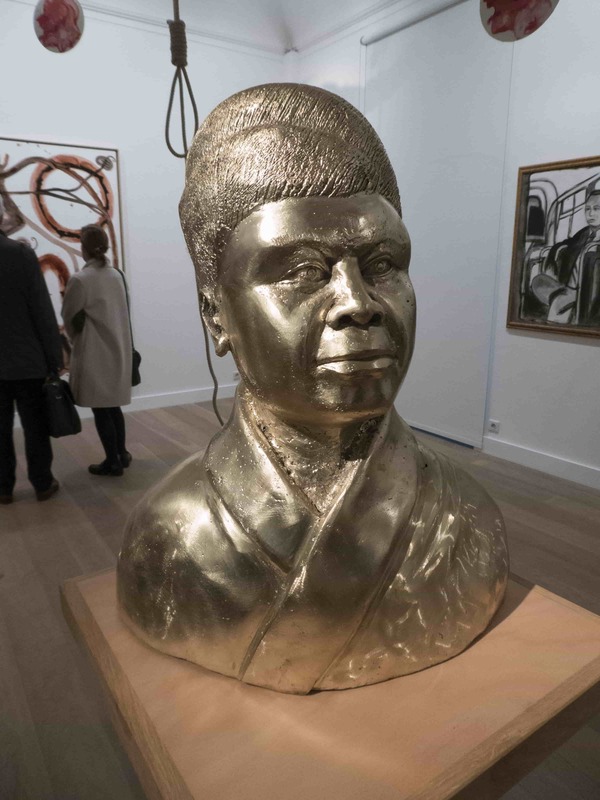 Near the center of the exhibition, a brass sculpture of Ida B. Wells commands your attention. 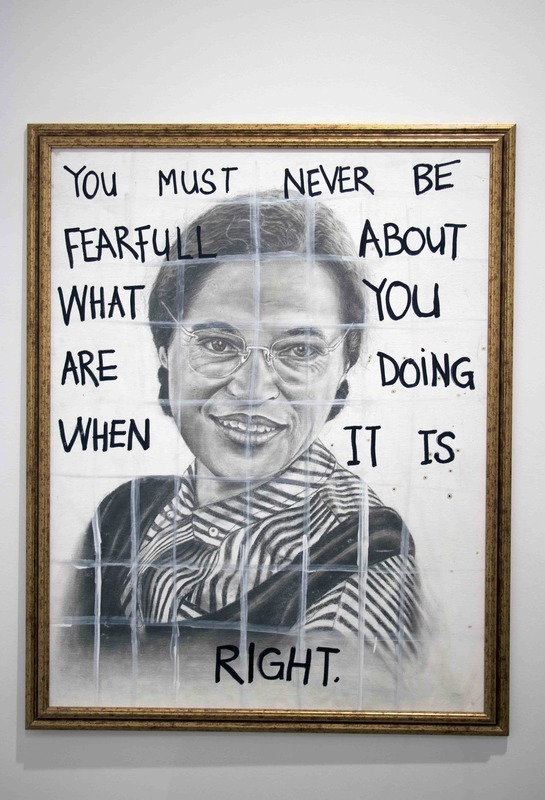 On the wall nearby are paintings of Rosa Parks. 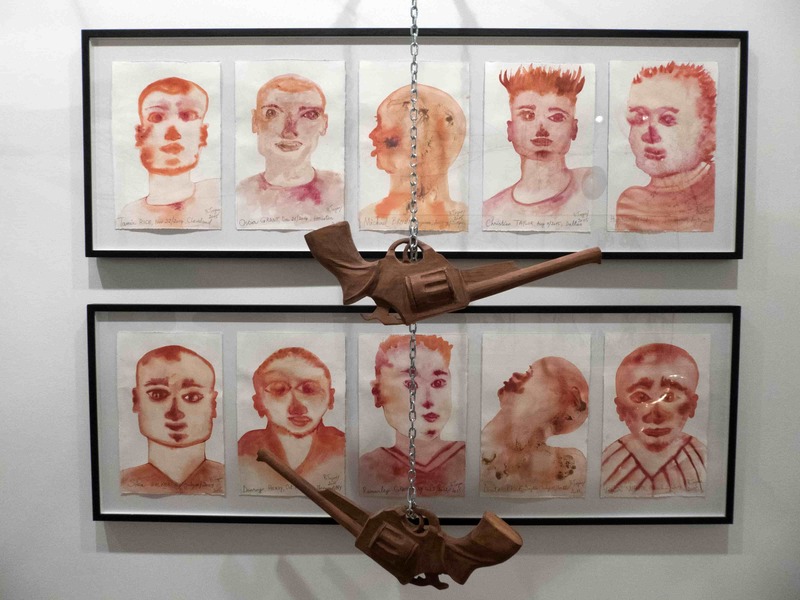 Toguo has immortalized several black male victims of police violence in Black Lives Always Matter (2015). Wooden pistols hang in front of this work. A larger installation of wooden pistols lies on the floor near the entrance to the exhibition room (Don’t Shoot I to V). 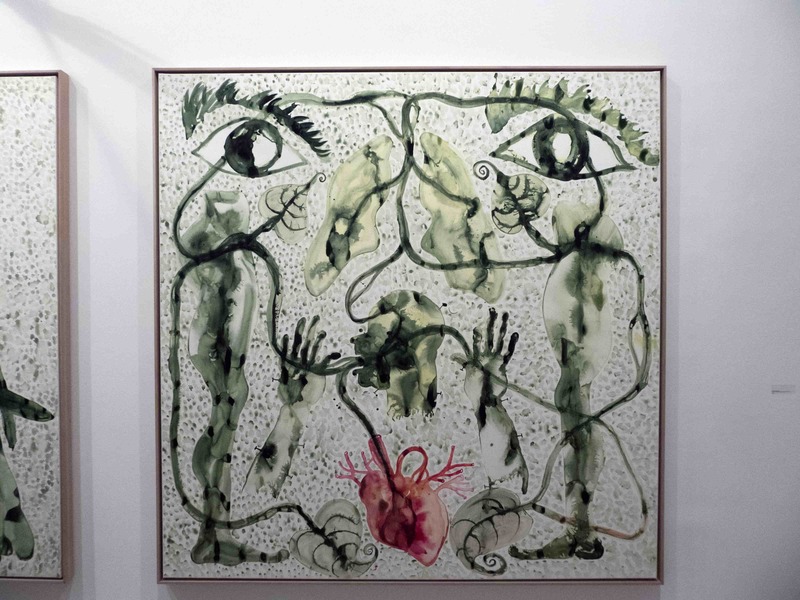 True to his penchant for portraying parts of the human anatomy, Toguo has created a clever ink and acrylic painting called Heal the World in which he has composed an abstract face from eyes, limbs, lungs, a head, and a heart. I have admired this artist’s work for many years. I finally had the chance to meet him at the opening on October 12. Toguo was one of four artists nominated for the 2016 Marcel Duchamp Prize, a prestigious annual award given by the Association for the International Diffusion of French Art. In 2011, he was made a Knight of the Order of Art and Literature and in 2015, he was made a Chevalier des Arts et Lettres in France. He founded Bandjoun Station, a centre for artistic exchange between local and international artists, in Bandjoun, Cameroon in 2007. The Centre Pompidou in Paris owns several of his works. Strange Fruit will run through November 25, 2017. 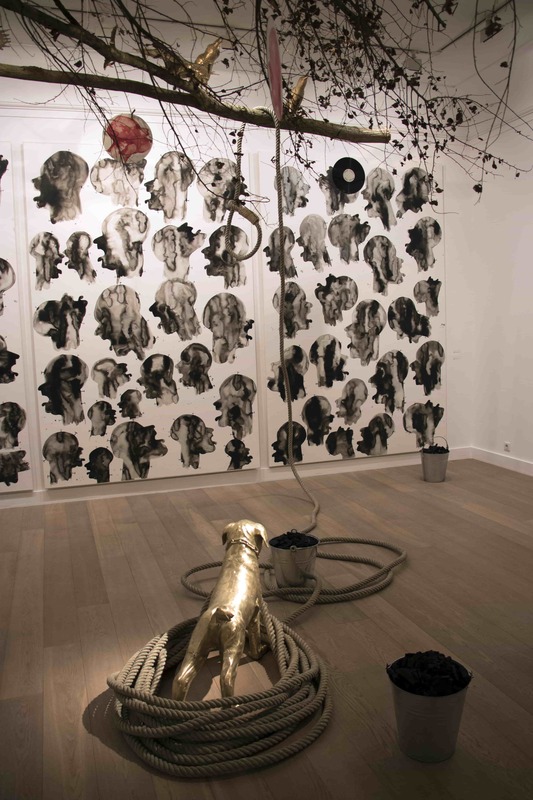 To see an article about a past exhibition of Toguo’s work at Galerie Lelong, click HERE.